This evening’s debate will now transition to amendments relative to health and human services. Below, you will find the amendments offered by House Republicans, along with a brief description of the amendment. Amendment 2 - Connector Cost Study (Jones, Bradley) ADDS a new outside section directing the Executive Office of Health and Human Services (EOHHS) to review the financial impact of the failed Connector website. The review is to include a cost analysis of state funds expended for temporary coverage, including those funds that would have been reimbursed by the federal government. This language also directs the EOHHS to investigate ways to recoup such funds under the state’s contract with CGI Group, Inc. The EOHHS is required to provide the Legislature with a report of its findings by July 31, 2014. Amendment 18 - Study of ER Co-payments (Jones, Bradley) ADDS a new outside section establishing a special commission to investigate the use of co-payments for MassHealth members, including the potential savings that would result from charging a co-payment for the use of emergency care in nonemergency situations. Directs the commission to submit its report to the legislature within 90 days of passage. Amendment 25 - Study of Expanding Medicaid Express Lane (Jones, Bradley) ADDS a new outside section directing the Executive Office of Health and Human Services (EOHHS) to conduct an investigation of all federal and state assistance programs to determine which have eligibility requirements within the requirements of MassHealth and which could feasibly share data with the MassHealth program for purposes of renewing eligible children and parents in MassHealth through the express-lane program, created under the Children’s Health Insurance Program Reauthorization Act of 2009. Requires the EOHHS to submit a report to the Legislature of its findings by April 1, 2015. Amendment 39 - Study to Enroll Inmates in MassHealth (Jones, Bradley) ADDS a new outside section directing the Director of MassHealth, in collaboration with the Department of Corrections, to study the feasibility of enrolling incarcerated persons, who are eligible for medical assistance, into MassHealth. The study will look at the potential cost savings to the state of enrolling eligible inmates into MassHealth, which allows medical services provided outside of the prison to be reimbursed by the federal government. Currently, the state is paying for all medical care provided to inmates. Amendment 128 - An Amendment to Create Benefit Eligibility Verification Integrity (Fattman, Ryan) ADDS an outside section requiring applicants and recipients of MassHealth to have their assets, income, and identity verified by a computerized integrated eligibility system. 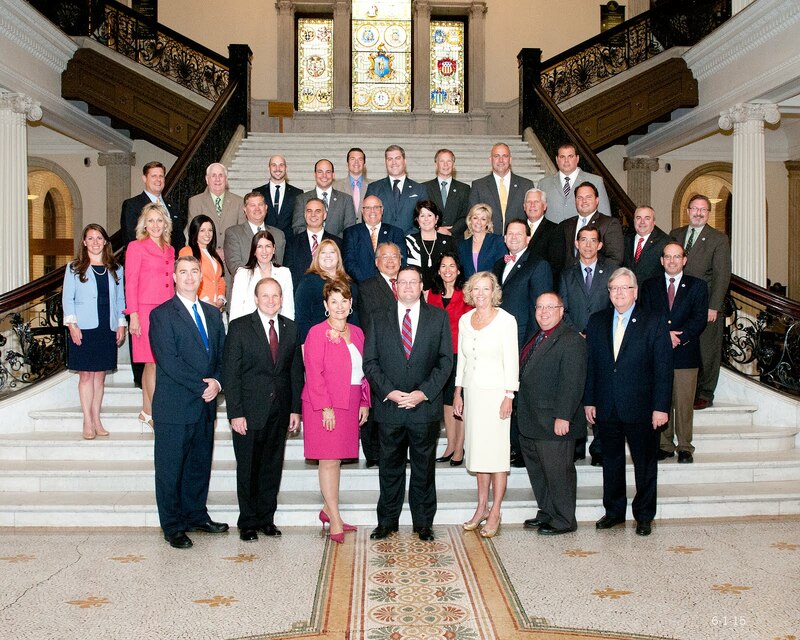 Amendment 458 - ACA Waiver Request (Jones, Bradley) ADDS a new outside section directing the Governor to formally request the Massachusetts' congressional delegation to file legislation to grant the state a waiver from the Patient Protection and Affordable Care Act (PPACA). Also, requires the Governor to report monthly to the legislature on the status of the negotiations and any proposed legislation. Amendment 565 - An Amendment Relative to Proof of Residency (Lyons, James) ADDS a new outside section prohibiting self-declaration of residency from being accepted as a valid form of residency verification for individuals applying for a public welfare program. Exempts Senior Centers from this requirement. Amendment 589 - An Amendment Relative to Public Benefits Requirements (Lyons, James) ADDS a new outside section stating that all state and federal public benefits shall only be received by residents of the commonwealth with verifiable documents or identification. Amendment 599 - An Amendment Relative to Proof of Residency (Lombardo, Marc) ADDS a new outside section prohibiting self-declaration of residency from being accepted as a valid form of residency verification for individuals applying for a public welfare program. Exempts Councils on Aging from this requirement. Amendment 604 - An Amendment to Account for Budget Expenditures (Lyons, James) ADDS a new outside section directing the Executive Office of Administration and Finance to prepare a report of budget expenditures made on behalf of different citizenship statuses, including those whose residence cannot be established. The report must be filed by October 15, 2014. Amendment 613 - An Amendment to Account for Health Safety Net Expenditures (Lyons, James) ADDS a new outside section requiring a ANF to prepare a report detailing expenditures from the Health Safety Net program, and for whom those expenditures are rendered. Amendment 667 - An Amendment to Establish a Commission to Study State Spending (Lyons, James) ADDS a new outside section establishing a commission to investigate state spending on American citizens, Green Card holders, and those whose immigration status cannot be identified. Amendment 816 - Relative to lawful permanent resident status (O'Connell, Shaunna) ADDS a new outside section requiring the verification of immigration status of all SNAP, TAEDC and EAEDC applicants for lawful permanent resident status. Benefits may not be granted to lawful permanent residents who have resided in Massachusetts for less than 5 years. Waivers may be granted, and the Department of Transitional Assistance shall verify the assets of the sponsor in cases other than self-petition under a federally protected status. Amendment 989 - Mass Health Benefits for Inmates (Vieira, David) ADDS a new outside section directing that MassHealth members have their benefits suspended rather than terminated while incarcerated. MassHealth benefits would be immediately reactivated upon release from a penal institution or upon becoming inpatient in a medical facility or if they are living outside of the penal institution, are on parole, probation or home release.